Today I am featuring Salt & Pepper @ The Liaison Collaborative, a gacha @ unKindness main store and couples pose from Luanes World. The adorable lil dress from Salt & Pepper is available at the birthday round of The Liaison Collaborative. There are 5 pretty colors to choose from. Get 2 bonus prints when you purchase the fatpack for only L$799. The dress is made for Slink Physique, Hourglass and Maitreya. The Waterside Market Gacha is available in the unKindness main store. 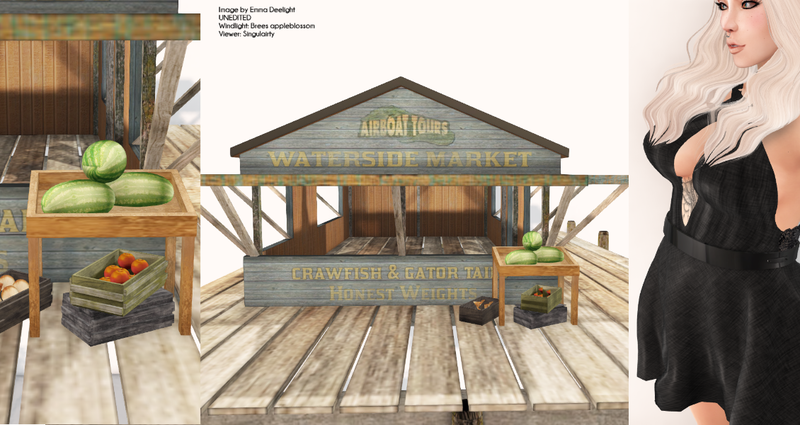 Try your luck for the rare building, dock, boat and get yer grub sign or collect all the market goodies. The pose we are using is from Luanes World. Just rez the pose balls, un-link to edit the position and have fun with this lovely pose. I captured the image at the lake at the back of Deelights Resort. Find this hidden gem, have a romantic dinner with your partner or get up to a lil adult fun. *winks* I hope you enjoy today's look.